There, she won junior titles in the 400, 800 and 1.500 meters. That fall, she and her coach at CUBU Swim Club, Yuri Suguiyama, sat down and talked about her future. Ledecky’s times kept dropping, her performances rising. Phelps’s coach (Bob Bowman) was so impressed after watching at a grand prix meet in Charlotte in May that he brought her up out of the blue to a roomful of reporters at the U.S. Olympic media summit days later, saying she was a youngster to keep an eye on. Terri McKeever (coach of the U.S. Olympic women’s team) also watched Ledecky in Charlotte, when she swam a career best in beating a veteran field. 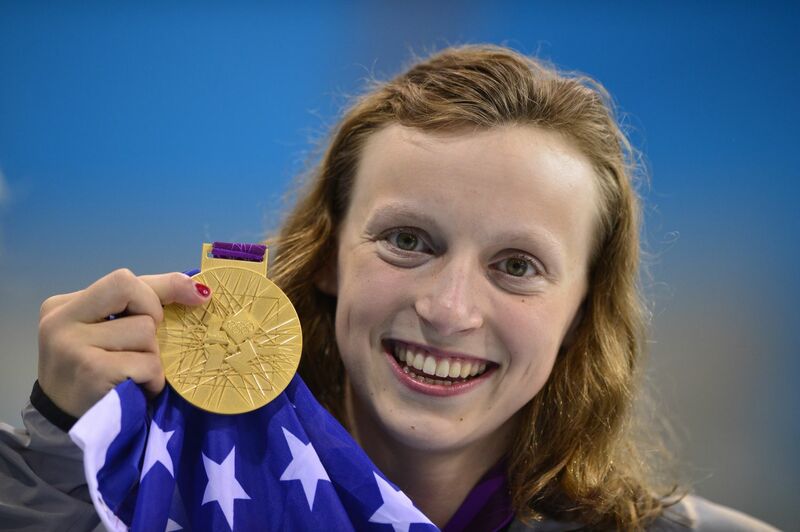 Information about 15-year-old Katie Ledecky, the youngest member of the entire U.S. Olympic team, was scarce when Teri McKeever, the U.S. Olympic women’s swimming coach, gathered her team together at a training camp in Knoxville last month. Those three weeks have now passed, and McKeever can indeed tell everyone a lot more about Ledecky. For starters, she is no longer overwhelmed, and she has definitely come out of her shell. Ledecky’s near-world-record performance in winning a surprising gold medal in the Olympic 800-meter freestyle Friday night is proof. The high school sophomore from Bethesda, Md., broke Janet Evans’ 23-year-old U.S. record in the longest distance the women swim and came within half a second of breaking the world record, winning the gold with ease in 8 minutes 14.63 seconds. “Katie is not your typical 15-year-old” – McKeever said after it was over, after Ledecky had won by more than four seconds over her nearest rival and more than 5,5 seconds over Great Britain’s Rebecca Adlington, the bronze medalist who just hung on to her four-year-old world record of 8:14.10. “Watching her day in and day out, her attention to detail and her focus, it’s just really impressive for a 15-year-old” – McKeever said. Ledecky took off at a stunning pace and maintained her lead, leaving defending champion Adlington and Danish rival Lotte Friis floundering. Ledecky finished in eight minutes 14,63 seconds, four seconds clear of second-placed Spaniard Mireia Belmonte Garcia. Adlington finished in 8:20.32 for her second bronze medal of London 2012. “I am proud to get a bronze, there is nothing to be embarrassed about” – Adlington, the 2011 world champion, told BBC Sport. “I hate it when people say it is losing because you have not done my sport. Swimming is one of the hardest events to get a medal at. There was nothing the Briton or Friis, the fastest qualifiers and pre-race leading candidates, could do to arrest Ledecky’s phenomenal pace. Friis crept home in fifth. Adlington swam to 400m bronze earlier in the week in a time of 4:03.01. Here, Ledecky ripped through 400m in 4:04.34 – just a second slower – en route to gold over twice the distance. By that point, Adlington was only a second back, but this was a far faster start than she might have expected. She faded as Ledecky, eight years her junior, pressed home her advantage. Friis and Adlington are used to racing each other and know each other’s strategies. Ledecky (the unknown quantity) met the pair for the first time in a major final and turned the element of surprise into Olympic gold. Ledecky is the youngest Olympian on the 529-strong American team and the second-youngest Olympic swimming medallist in US history. Adlington sliced almost a second and a half off her qualifying time as she tried to deliver gold for Britain, but Ledecky found a staggering nine-second drop from her own heat. This entry was posted on Saturday, August 4th, 2012 at 4:50 am	and is filed under Sports. You can follow any responses to this entry through the RSS 2.0 feed. You can skip to the end and leave a response. Pinging is currently not allowed.